A bid-matching service is a process whereby a search is conducted on an ongoing basis of all federal solicitations in order to identify and select the ones that match a customer's sales capabilities. At Lamlinks, we use a variety of search techniques to ensure that no possible match is overlooked and that every item from a customer's award history is identified. Need a drawing but it's not posted to C-Folders? Forget to download the TDPs before the solicitation closed? Don't wait another second. Get the latest drawings directly from Lamlinks using our TDP Library service. We offer three tiers of service so you can pick the one that's right for you. Try a free trial today. LamlinksPro's elegance lies in its database by eliminating double-entry. Witness the simplicity in the Purchasing and Warehouse module where you can create a PO with just a few keystrokes. By recording vendor responses to your RFQs, the LamlinksPro database already has vendor, item, pricing and delivery information. 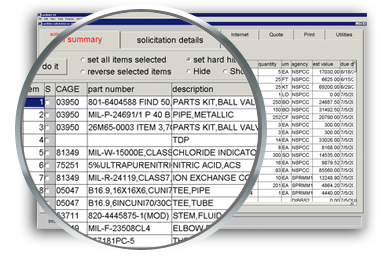 All you need to do is pick who you want to buy the part from and push print to create a purchase order. Lamlinks Corp. offers unparalleled customer service. Need an answer? Call us (323) 469-4560. You’ll never be greeted by an automated phone message system. We’ll help you any way we can. Messages and emails are always responded to in a timely manner. In addition, our online knowledge base and support can be accessed everyday 24 hours a day.